Brian Scott (pictured) - A morning host on KUCI 88.9FM out of Irvine, so says his LinkedIn bio - claimed top honors as the final five players in the $350 Jacked Stacked II brought the tournament to a close. Here’s a look at all 134 payouts from the three-day, two-flight event that drew 1,062 entries and the players created a prize pool of more than 3x the $100k Guarantee. We all know the Commerce Casino in Los Angeles is the world’s largest poker room, but even with that, how about the numbers that came to the second-floor tournament area here the past 48 or so hours. 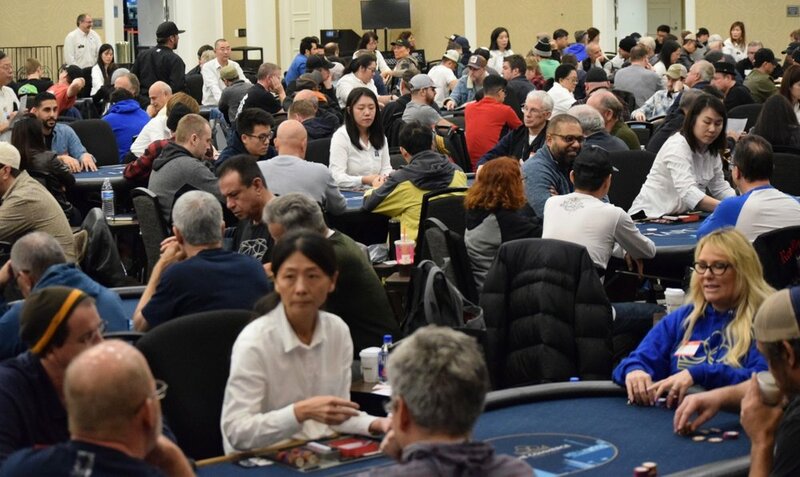 Add in Friday night’s $570 Triple Triple Draw (68) and Saturday night’s $350 Survivor (165) and the 2019 LAPC players offered up 2,585 buy-ins from 1pm Friday until 8pm Sunday. Registration has closed on Event 35 in the 2019 LAPC - $50,000 Guaranteed $175 Triple Stack Turbo - and the board shows 347 entries. The players created a prize pool of $50,315, paying 44 places, with tonight’s winner receiving a Remington and $10,665. Here’s all the scheduled payouts. Tonight’s $175 Triple Stack Turbo with a $25,000 Guarantee - Event 35 in the 2019 LAPC Series, posted a 347-entry field as registration has just wrapped up - Pay Table coming soon, but it appears the guarantee doubled.